Posted By:Unknown | At:1:32 PM Be the first to comment! TUCSON — Representative Gabrielle Giffords, the Arizona Democrat who was gravely wounded in a shooting rampage, remained in critical condition on Sunday but has been able to respond to simple commands, and her doctors described themselves as “cautiously optimistic” about her recovery. At a news conference at University Medical Center, the congresswoman’s doctors said that she was the only one of the victims of Saturday’s shooting to remain in critical care at the hospital. They said that she was lucky to be alive but would not speculate about the degree of her recovery, which they said could take months or longer. 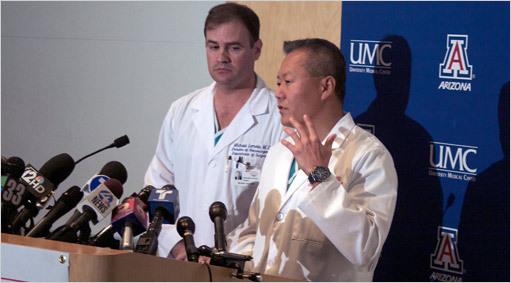 Dr. G. Michael Lemole Jr., the chief of neurosurgery, who operated on Ms. Giffords, said that the bullet had traveled through the entire left side of her brain “from back to front” but said that it had not crossed from one side of the brain to the other, nor did it pass through some critical areas that would further diminish her chances of recovery. The doctors said that brain swelling and other complications still posed large risks in the days ahead. Darci Slaten, a spokeswoman for the medical center, said the congresswoman’s husband, the astronaut Mark E. Kelly, was with her, as were her parents and two stepchildren. As the doctors provided the update on Sunday, law enforcement authorities tried to piece together what prompted a troubled young man to go on a shooting rampage here that killed six people, including a federal judge, and wounded Ms. Giffords and 13 others. The authorities called for the public’s help in finding a possible accomplice who was still at large. The director of the Federal Bureau of Investigation, Robert S. Mueller III, who traveled from Washington to oversee the shooting investigation at President Obama’s request, said that he expected the first charges to be filed against the gunman, Jared Lee Loughner, 22, on Sunday afternoon. Among those killed were John M. Roll, 63, the chief judge for the United States District Court for Arizona, and Gabriel Zimmerman, 30, who was the director of community outreach for Ms. Giffords. The others who died were identified as Christina Green, 9; Dorothy Morris, 76; Dorwin Stoddard, 76; and Phyllis Schneck, 79. Mr. Mueller, at a news conference, said he expected Mr. Loughner to be charged with assault in the shooting of Ms. Giffords and with the murder of Judge Roll. Two bystanders tackled Mr. Loughner at the shooting scene and held him until he was arrested.